The game at Tannadice has been called off after a weekend of heavy rainfall. 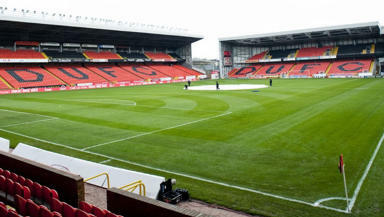 Dundee United's Scottish Premiership clash with St Johnstone has been postponed due to a waterlogged pitch. Heavy rainfall over the weekend saw the home side call an early pitch inspection. And after checking the surface, officials ruled that the game could not go ahead. The decision means that St Johnstone goalkeeper Alan Mannus will now miss Saturday's League Cup semi-final through suspension. The Northern Ireland international was set to serve the second game of his two-match ban against United but that will now be carried over to the game with Aberdeen. Two Scottish Championship games were postponed at the weekend with Raith v Alloa and Dumbarton v Livingston called off due to the wet weather.